Sometimes, when preparing posts for this blog I have little more than a delicious recipe and some enticing photos as evidence that I’ve actually cooked said recipe. I’ll sit in front of my laptop and um and ah through many ultimately deleted lines trying to compose a post. Do my readers expect a back story to the recipe, do they expect a recipe at all? Could Please Pass The Recipe simply disappear because I was lost for words? I can hear the disbelieving chortles from here. Those that know me well would never believe that silence is possible and I admit that generally I’m not shy of making myself heard especially if I have something significant to say. Cooking comes to me much more naturally than writing. Cooking, along with eating is my favourite pastime. Food cooked with love always has a willing and appreciative audience, and that in itself is all the encouragement I need to keep me in the kitchen. This dish I’ve cooked over and over and each time its a variation of the time before. With apologies to Greg Malouf I confess to having adapted, embellished, simplified and reinvented his vegetarian recipe for Carrot Tajine. Ironically this meatball version is my best effort yet. Knead all the ingredients together with wet hands. Roll into 3cm balls and chill until needed. Heat the oils in a large pan. Add the grated carrot, celery and ginger and saute over a medium heat until translucent. Add the spices and saute briefly, then add the currants, sugar and stock. Bring the stock to the boil, then gently slip the meatballs into the simmering pan. Once the sauce has returned to the boil, cover the pan and reduce the heat to low. Poach the meatballs for 30 minutes then skim off any fat that has floated to the surface of the sauce. Mix the yoghurt and cornflour together and add it to the pan. Increase the heat to medium and gently stir until the sauce is thick and creamy. Stir through the preserved lemon, then adjust the seasonings. Scatter the coriander over the surface and serve immediately with baby carrots, zucchini and couscous. This looks great. I like the grated carrot in the ‘sauce’. Yes, I, too, know what it’s like to question whether it’s time to share a “work in progress” recipe. I’ve a few like that. Each iteration is a variation of all that came before. Even when published, I continue to “develop” the dish. I doubt, however, that any such development would be needed here, Sandra. This dish sounds perfect just as it is. Thanks for keeping it real….words don’t always come easily regardless of how articulate we may appear! I will be trying this for the lads….right up their alley. I Thanks Cheery. think any blogger who says differently is not being entirely honest. Your koftas and tajine sound like something my family would love… can’t get enough of middle eastern spices. Enjoy your weekend! Spot on Margot, finding a meaningful personal voice through writing is quite a challenge. How absolutely wonderful and copiable! And methinks most if us want a recipe to try but also very much a personal story alongside! Was hugely amused on a well-known Sydney blog when someone with a sore head told the blogger ‘to cut the waffle and get onto the recipe’ !! And the normally peaceful readers went kind;of berserk virtually telling her to . . . well, you know! Sandra – as you would well know blog followers become blog-buddies and then quietly but immutably become friends . . . that surely is the best part . . . Your posts are so articulate and enjoyable I would never guess you sometimes are at a loss for words. The recipe sounds and looks delicious. Hi. This looks very good, will have to put it on my list to try and look forward to following more of your posts. My stomach is rumbling! That sounds delicious. Ah, you’re coming in to fall, aren’t you?!! This is lovely. I love that the lamb is in the form of meatballs. Excuses, excuses, Ron 🙂 ! So is that the reason the promised prawn pancake recipe ex-Lund sources has not appeared in my letterbox yet ? 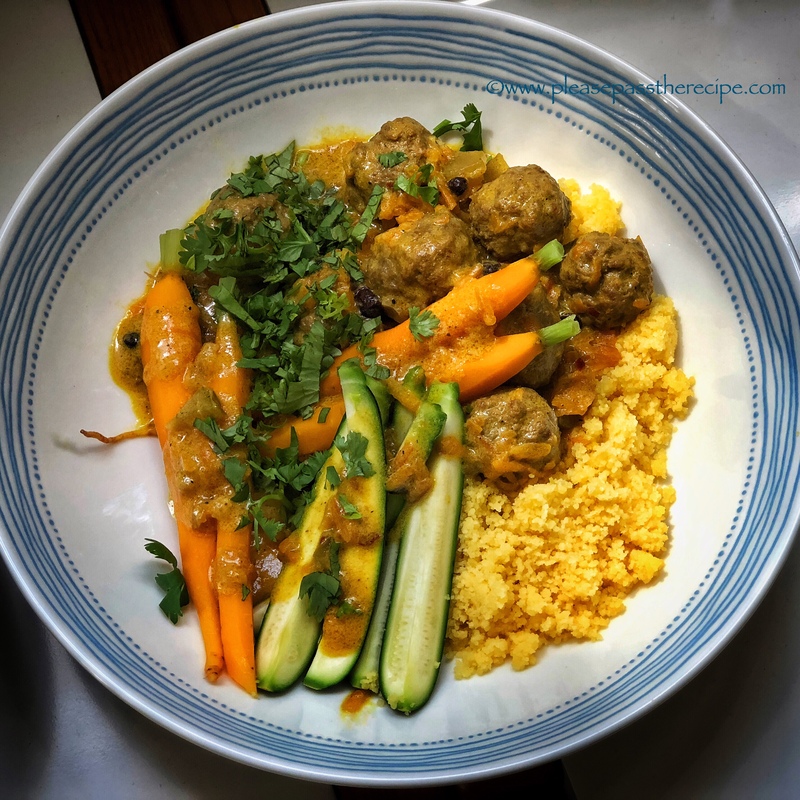 This entry was posted on March 8, 2018 by ladyredspecs in Cooking, FODMAP diet, Food, Gluten Free, Lamb, Main Meals, recipes and tagged carrots, FODMAP diet, gluten free, lamb, meatballs, tajine.